A few days back, we went to a very popular bird spotting site named Bhigwan, about 100 kilometers from my home. Huge flocks of migratory birds arrive there every year. We had plans to photograph painted storks and flamingos. The water level and wide mud-lining around the lake didn’t give us a chance to get close to painted storks that had already arrived. So we will have to wait for a month or two for the water level to lower and the mud to dry, and then revisit. And flamingos hadn’t arrived yet! What came to our sight was Grey Heron everywhere. We were about to reach Bhigwan when a grey heron flied from above us. We reached there and a grey heron was waiting to welcome us. We parked our car at a safe place, opened a door, and a grey heron took flight of fear! We walked a bit, looked left and a grey heron was having breakfast of a frog :) We turned right and there was a grey heron shamelessly showing off its ugly body inside, opening its wings full apart. The trip was to photograph painted storks and flamingos. What we were gifted was uncountable number of grey heron. But it was not a waste at all. 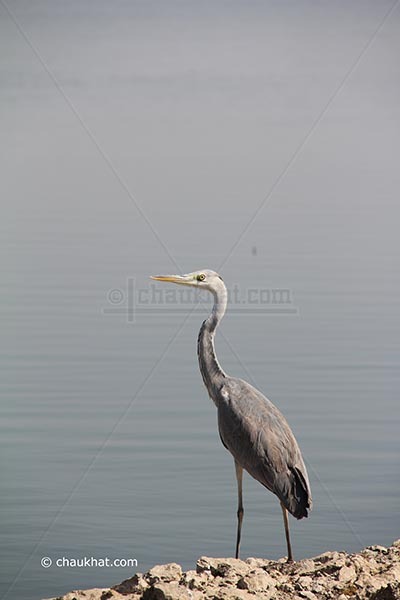 The photographs of grey heron we were able to record are simply exceptional in our view. Let me know what you think looking at these 2 photos of grey heron. I think you did quite well with your grey heron, Bhavesh. I've only seen the white ones here. @ RNSANE: Actually the above photos were taken by Megha :) She's way better than me in photography as well! I liked them very much! @ Miss Val's Creatings: They must be equivalently beautiful, or probably more beautiful than grey herons!